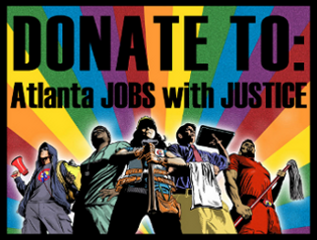 Atlanta Jobs with Justice teamed up with the Communication Workers of America (CWA) the Teamsters and Occupy Atlanta to first hit Home Depot with a flash mob over the efforts of their contractor Republic Services to undermine their workers union contracts. From the Home Depot we marched to the other end of the shopping center to the Verizon Wireless store. Normally the Atlanta Police Department asks us to leave right away. Because of our numbers and our spirits it was not feasible for them to do this. There were three Atlanta Police Officers watching us from inside of the store. Eventually, two large police vans arrived to the scene along with at least 7 Atlanta Police cruisers. The police officers had zip ties on hand and were ready to arrest folks. When we saw this we left for the front of the parking lot and picketed on the busy street for about 20 more minutes and heard speeches from the CWA, JwJ, Teamster reps and state senator Vincent Fort. This marked a level of intensity and numbers that surpassed our events even when the CWA and IBEW workers were on strike. These are the events we need to stop the Verizon greed that threatens to undermine decent wages, benefits and working conditions for working families across our country and to stop companies like Home Depot from acting like they have no responsibility for the actions of their own contractors. For more information about about the Verizon campaign go here. Here is an article about the situation with Republic Waste Services. Atlanta Needs Full Employment Now! Two Corporate Giants, One Saturday Morning.